Boudin (pronounced Boo-dan) is a rice-based sausage that comes from the blending of Cajun, German and Creole culinary traditions. And because Cajun is a slang evolution of the word Acadians (French Canadians), one can trace its history back to Canada by way of France. 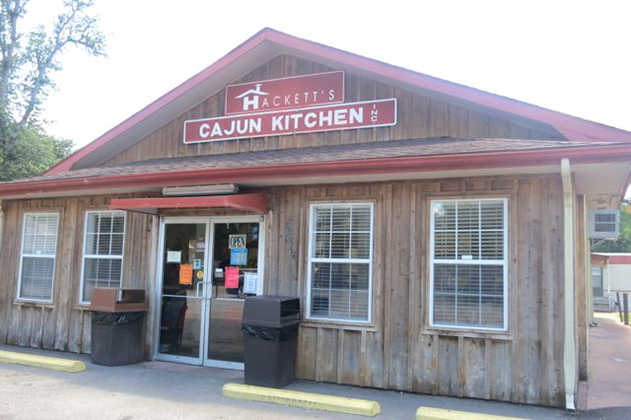 My first taste of Boudin was at Hackett’s Cajun Kitchen on Gerstner Memorial Boulevard in Lake Charles, Louisiana. It’s a simple little shack and the most unlikely place to inspire anyone to stand in line for hours, but the people of Lake Charles, Louisiana do. They all come looking for boudin made fresh every morning by Hackett’s Boudin Masters. 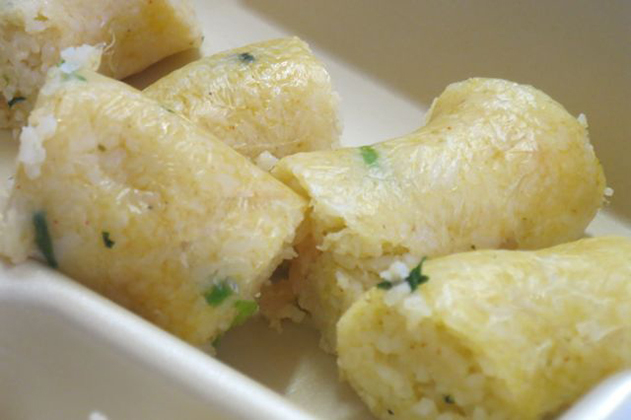 White rice is a major crop crop in Southwest Louisiana and they only use Louisiana rice to make boudin. The cooked rice is mixed with parsley, diced meat (could be pork, any type of seafood, alligator and even liver). To this they add the Cajun Trilogy (diced white onions, green bell peppers and celery) and a very special blend of spices. Like a winemaker crafting fine wines in his own distinctive style, so does each boudin master design his own special blend of spices for his own signature flavour. 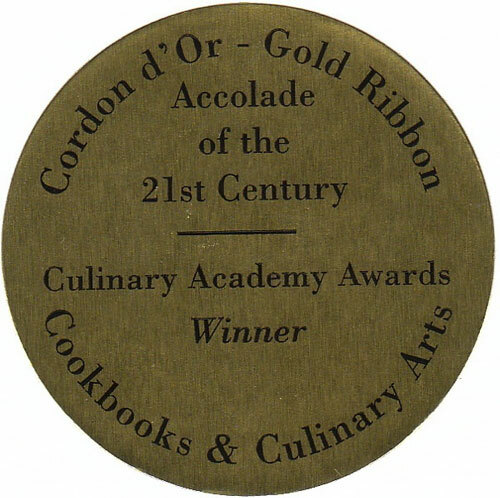 No two boudin masters make a similar tasting boudin. Because the ingredients are cooked before it’s stuffed into casings, Boudin is immediately ready to eat. 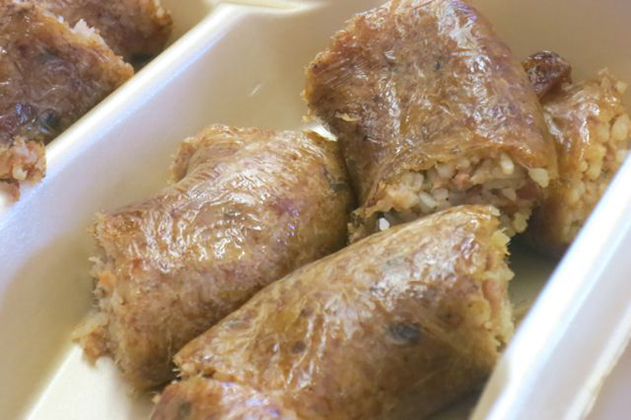 You can eat Boudin on the run, in the car or as a snack; it’s Southwest Louisiana’s favourite finger food. But if you eat it at the beach, you must squeeze the insides into your mouth with your teeth and throw the casings to the birds – just another boudin tradition. I tried Hackett’s Shrimp Boudin. It was light, silky and buttery with the sweet flavour of shrimp in every bite. The ultra delicate insides squeezed out of the casings with every bite so instead of fighting with it, I reverted to using a fork and not my fingers. Obviously I’m a novice boudin eater, but this is so delicious I can’t wait to get better at it! All boudin shops have a smokehouse in the back where they smoke boudin over oak, hickory or pecan wood. At Hackett’s you’ll find both fresh and smoked boudin in seven flavours that range from plain or simple shrimp to the more complicated crawfish jalapeno, alligator and spicy smoked. I tried with the Spicy Smoked. This one was rich and robust with mouthwatering savoury flavours that filled my mouth and travelled right down to my toes! Oh yum, the heated spiciness lingered long after the boudin was swallowed. This is an amazing flavour experience. As good as the first two flavours of boudin were, if you ever get to Hackett’s, I highly recommend the Smoked Jalapeno Boudin. OMG, it’s spicy, savoury, peppery and uber-delicious – my favourite by far! While the origins of boudin are a combination of many cultures, today, Boudin is 100% Louisiana and everyone who tries it falls madly in love with boudin – me too! I lined up at Hackett’s with the natives of Lake Charles because if you don’t you’ll miss out. It’s made fresh every day and usually sold out by 3 in the afternoon – a crime to miss it. I’m from Niagara and we have tender fruit and wine, in Southwest Louisiana they have boudin. 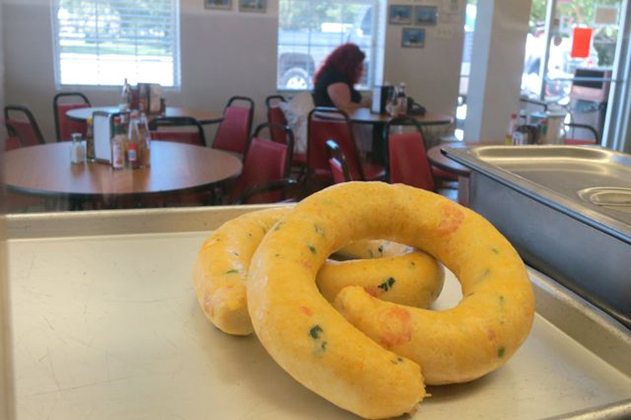 Check out the Southwest Louisiana Boudin Trail, pick a few boudin shops and go crazy. You’ll love it too! Strawberry Spaghetti – No Way! Yea!!!!! It’s strawberry season! Italian’s call it Fragola, German’s, Erdbeere and French, Fraise, strawberry by any name is the most celebrated spring berry around the world. Just last night I was out to dinner and I noticed the garnish on my dessert plate was a tiny strawberry. Now since we’re in the thick of strawberry season I wondered if it was actually a Niagara strawberry or a strawberry bought for convenience sake. I popped it into my mouth and sure enough, it was a super sweet, fresh, soft, spring strawberry. 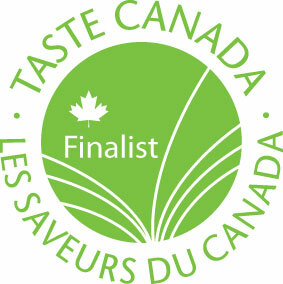 The flavour filled my mouth – yup! – this is a Niagara strawberry. The difference is so dramatic, I urge everyone to conduct a comparative tasting of strawberries. Simply purchase some of the imported berries and then go out to your local farm market or strawberry patch and pick out some fresh, juicy, ripe berries. Now, without adding anything to them, close your eyes and taste them. WOW! 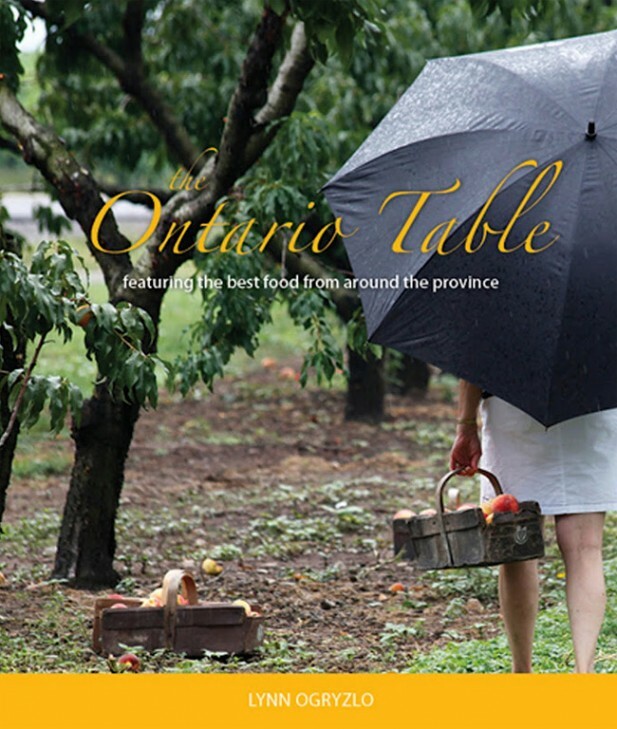 The berry from Niagara is much sweeter, has more intense flavour and is juicier than the faux fruit that comes from somewhere down south. It’s a good reminder of what a real strawberry tastes like. Makes me wonder why anyone would even bother to buy those “other” berries. The best strawberries are the ones you pick yourself or buy from your local strawberry patch during the harvesting season. Thankfully, we have many of them throughout Niagara. 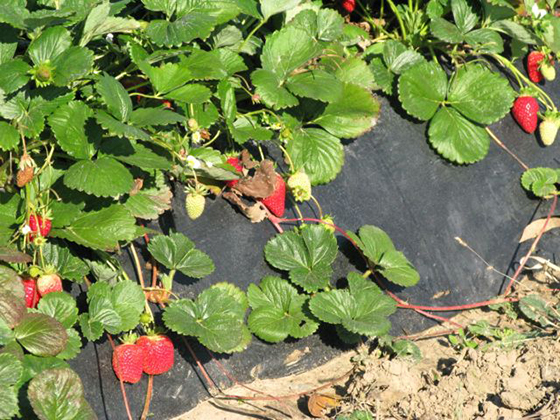 If you’re going to pick your own strawberries as so many families do now, try to pick early in the morning or later in the day when the fruit is cool. 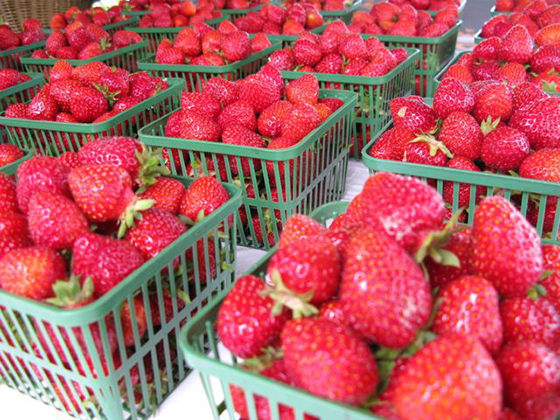 Strawberries are best used within 2-3 days of picking (that’s why the good ones don’t travel well!). A pint box of medium sized berries will generally hold 2 cups (500 mL) of berries, crushed berries will yield about 1 cup (250 mL) of purée. Berries can be used individually as a garnish for special desserts, on cereals or suspended in ice cubes for fancy drinks. I can always count on pleasing guests when I serve a bowl of fresh strawberries topped off with fresh whipped cream, spiked with a little bit of Fragola (strawberry wine). Fresh strawberries are great in a salad with a sweet strawberry, balsamic vinaigrette dressing. I remember Chef Greg Willis invented the strawberry and grilled brie sandwiches and now I see some chefs have evolved it into a baked brie appetizer topped with strawberry-rhubarb compote laced with ginger and black pepper. They say black pepper and strawberries go well together but it’s not a flavour combination I’ve ever warmed up to. I am however, fond of strawberries and cream cheese, or even goat cheese. I remember a strawberry and goat cheese pie I had once that was delicious and the combination also works well in a salad – add some chopped pecans for a spectacular flavour combination. The weirdest use of strawberries has to be in spaghetti; ripe tomatoes, aged balsamic vinegar and lots of freshly ground black pepper. The strawberries are sautéed in oil before being added to the spaghetti. Ok, it was awful!! And why would anyone do that to fresh Niagara strawberries? 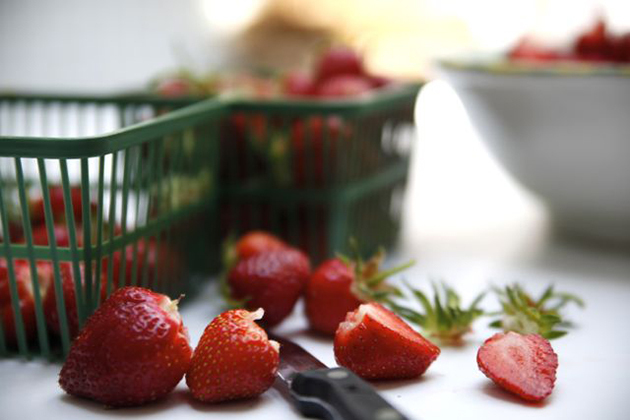 Enjoy this strawberry season, indulge, try new ways of preparing strawberries and preserve some for those winter days when a reminder of spring will brighten your day. 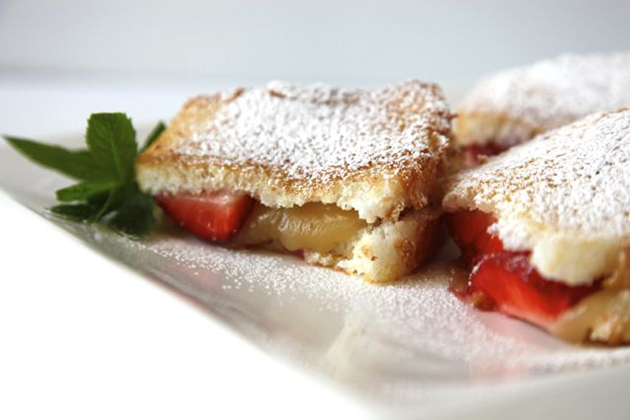 This is literally a “grilled cheese” sandwich, but with the sweetness of fresh strawberries. 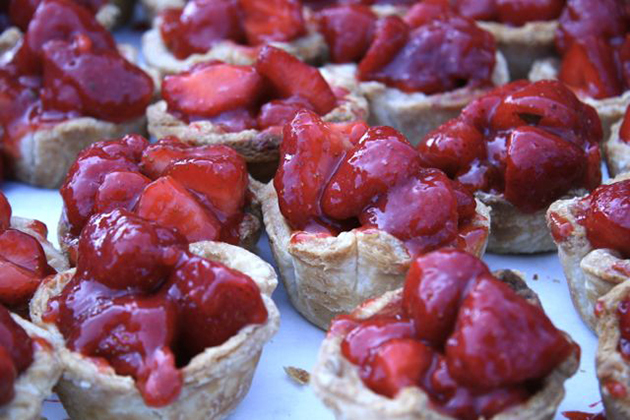 Eat this right away because the warm strawberries have a tendency to bleed. Butter the two outsides of the bread slices. On the unbuttered sides of each slice, spread the cheese evenly. On one of the slices, lay the strawberries in one layer evenly on the cheese. Top with the second slice of bread, making sure the buttered side of the bread is on the top. Grill on medium heat until golden brown, about 3 minutes. Flip the sandwich over and grill the other side for another 3 minutes or until golden brown. Serve warm.